The Brewery District offers a variety of local and domestic beers. The MLB All-Star game has come and gone, which featured four Cincinnati Reds, and we’re into the second half of baseball season. Playoffs are on the horizon and teams are working on making one last run. While the Reds are doing just that in the tough National League Central, now’s the time to go to a game and check out what they have cookin’. Executive chef James Major has created a menu across the stadium that pleases locals and out-of-towners alike. Cincinnati favorite LaRosa’s pizza is available in sections 113, 133, and 413. Get your barbecue mix at Montgomery Inn in those sections as well, plus 518. Of course, a trip to Skyline Chili is necessary. Find one of those stands in sections 103, 116, 130, 518, and 533. If you’re feeling really dangerous, try what some fans have dubbed the SkyRosa, a slice of LaRosa’s pizza wrapped around a Skyline cheese coney. The true gem of Great American Ball Park is the Riverfront Club. The fine dining restaurant is open to all ticket holders. Glass walls overlook the field from right field, plus the Ohio River, northern Kentucky, and the Roebling Suspension Bridge just outside the park. Fans can make reservations to enjoy something from their always-changing menu while watching the action below. Check out our photos of some of their best dishes, plus more options throughout the stadium. 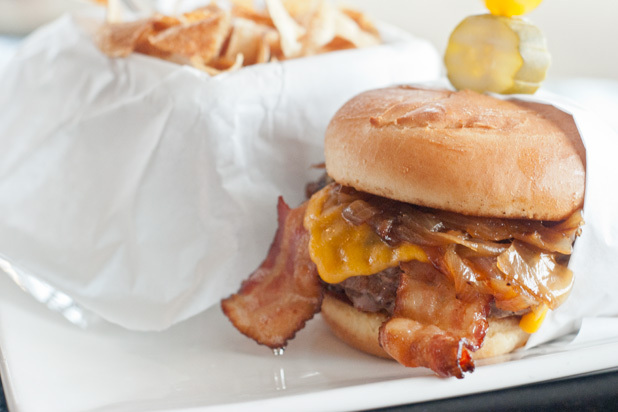 In the Riverfront Club, try the burger topped with applewood bacon, aged Cheddar cheese, and house-made steak sauce, served with with chips. 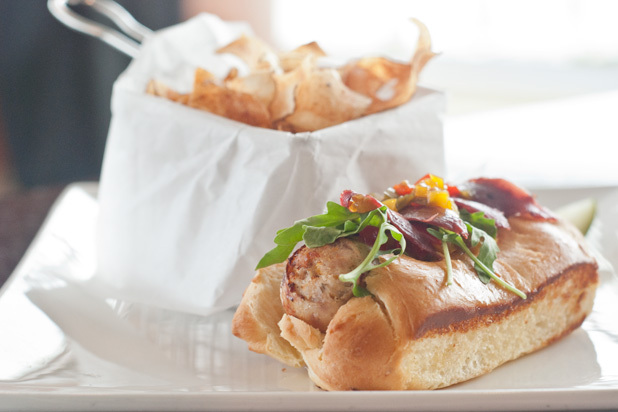 Also available at the Riverfront Club is this epic sausage — turkey and chicken sausage, duck prosciutto, arugula, and sweet pepper relish. Click here for more to eat and drink at Great American Ball Park. Jane Bruce is the Photo Editor at The Daily Meal. Follow her on Twitter @janeebruce.